Humility , courage and above all passion are what we found in East Troy, about 35 miles from Milwaukee (USA). Erik Buell is a modern knight, one of the pioneers of todays motorcycle race technology, who in 2002 was inducted into the AMA Motorcycle Hall of Fame Museum located near Columbus, Ohio. After twenty years of partnership with worldwide leading company Harley-Davidson, he is now owner of Erik Buell Racing, is old dream. Erik Buell (born in 1950 in Pittsburgh, PA) grew up on a farm in Gibsonia and learned to work on machinery at a young age. In his teens, Buell took up motorcycling. His first ride was on an Italian-made Parilla 90cc moped. Buell raced motocross before becoming interested in road racing in his early 20s. He became an avid part-time road racer and did his racing astride a Ducati in the AMA ‘Superbike’ class and a Yamaha TZ750 in ‘Formula One’, despite the aging race program at Yamaha. After receiving his degree in engineering in 1979, Buell flew himself to Milwaukee, where he got a job at Harley-Davidson. 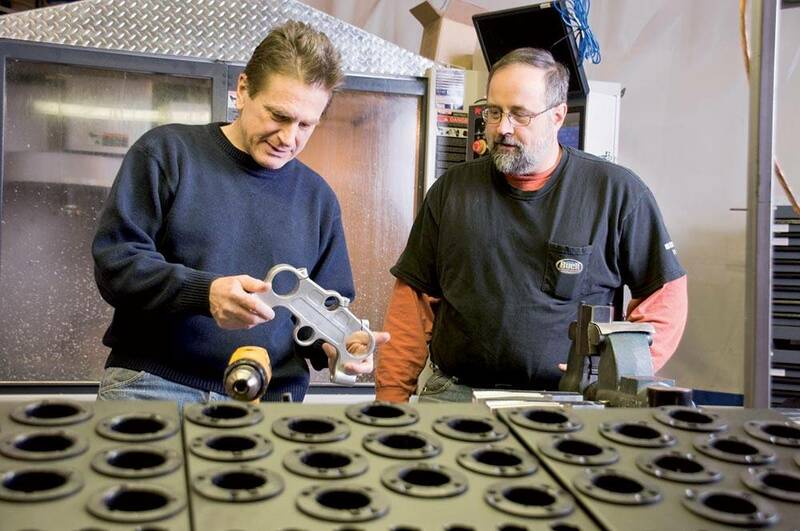 Erik Buell and Tim Mlinar machinist, discussing machining triple clamp for lighter weight. Erik Buell and Kemp Asbeck race technician with the 1125R DSB version. “If you want to improve and achieve new goals, fight for them first within the company by listening to the voices that have been excluded, those groups who are not happy and have been asking for change,” he says. 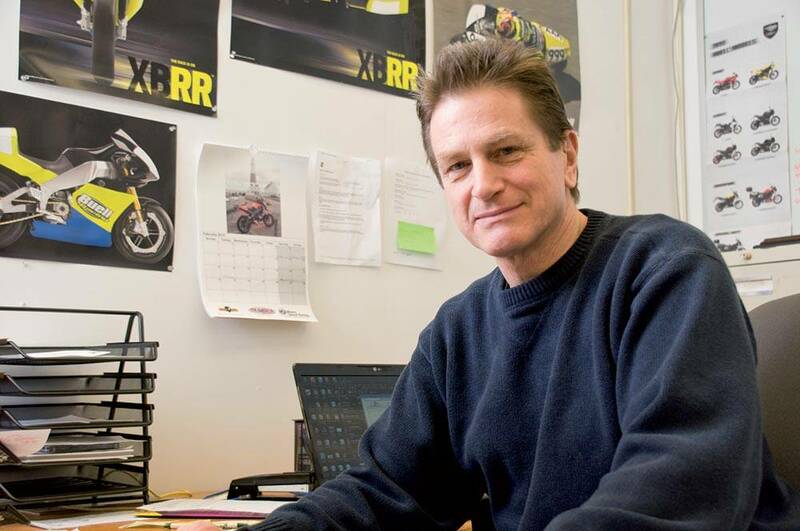 While working for Harley-Davidson, Buell’s road racing hobby was slowed down. Additionally, as Harley-Davidson went through some hard times in the early 1980s, he didn’t feel right racing a Yamaha or a Ducati motorcycle. “My dream was to build the perfect racing motorbike made entirely in USA. In addition, I was commited to creating jobs during a period of deep crisis in all the US markets.” In 1982 Buell purchased the entire stock of spare engines, parts, drawings, and the rights to produce and sell the engine of a the small, privately held general-purpose engine maker, Barton (based in Great Britain). Barton’s motorbike was very poorly made, using cheap materials and an engine that was plagued by gremlins to the point of being unusable. With Buell’s engineering background, he felt that he could refine the weak points using his own designs and make the engine work for him. Slowly, as parts failed he re-engineered them to increase reliability, and in many cases saw performance gains with his modifications. Buell’s passion to develop a perfect racing engine spurred him to leave H-D and strike out on his own. A people centered philosophy “Work with people you like and with whom you share common goals” says Erik Buell. He also firmly believes that it is important to listen to what consumers want and not just to think about the company’s business. In the 1990s, Buell restyled his production house to become the ‘Buell Motorcycle Company’ in which Harley-Davidson took a 51 percent share. Harley-Davidson bought complete control of Buell Motorcycle in 2003, and distributed all products through selected Harley-Davidson dealerships. Erik Buell remained responsible for all the engineering and designs. “My desire was to enter H-D into racing market; in short, to create a sort of dual market for the famous motorcycle house” he states. However, on October 15, 2009, Harley- Davidson announced that all production of Buell motorcycles would cease on October 30, 2009. 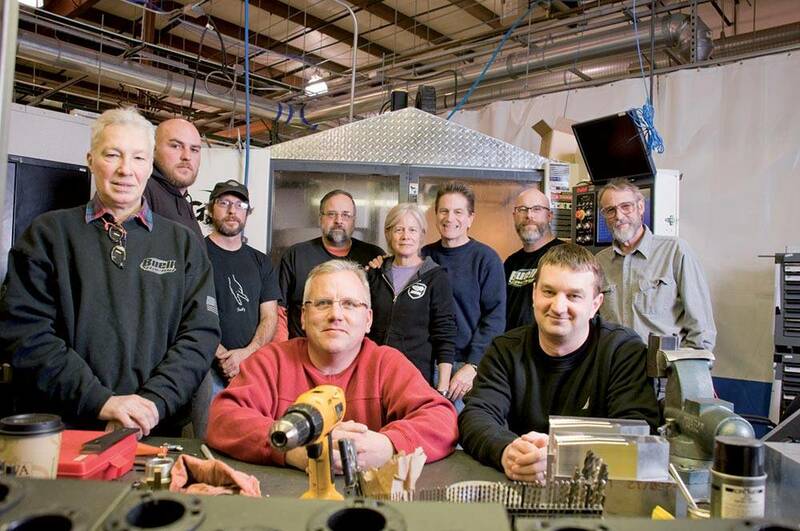 Standing L to R: Henry Duga friend, Bill Malzewski technician, Tony Neuburg lead engine technician, Tim Mlinar machinist, Tish Buell Erik’s wife, Erik Buell, kemp Asbeck race technician, kurt Hanson fabricator. Seated L to R: Michael Richter and John Fox engineers. For Erik Buell, being successful means always interacting with other people; it is not possible to achieve any kind of success if we live only inside ourselves. 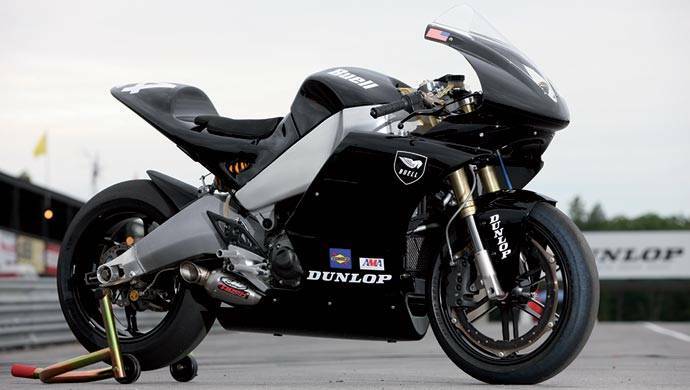 In November 2009, Buell launched Erik Buell Racing, which will continue to produce race only motorcycles. 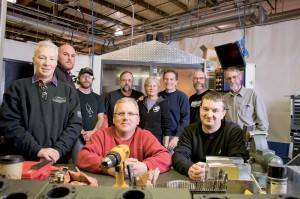 “It is a completely new company even though it was build on experience from H-D,” he says. 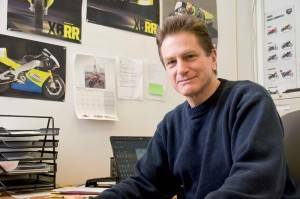 The closing of Buell production by H-D was a profound shock for Erik Buell. 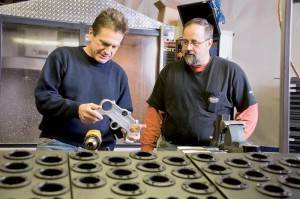 “I was devastated, honestly I wasn’t thinking only about myself but especially of all the employees and the thousands of customers.” The new company in a way was born because he started thinking about his friends, his collaborators, and how to maintain both the passion and these relationships. The development of this small new company in the arena of racing motorcycles will not be easy, because there are so many big companies with a lot of money to compete with. “I think that we can bring something new to this business. People are now complaining about the amount of money being spent in this arena and I’m sure that a small company like ours can breathe new life into the field”. There have been ups and downs, and someefforts have failed, but all these experiences have still produced growth. All of Buell’s experiences share one common denominator: the blind passion for the work. Erik Buell has no advice to give “Anybody with a mature career has made mistakes,” he says, “therefore there is nothing to forgive.” Erik Buell may have lost many battles but is stubborn about winning the war to achieve his dream. Because he well knows that, without a challenge, human beings lose their capacity for great thoughts and feelings. • Continue to interact with other people and build strong relationships. • Listen to what the consumers want and don’t just think about the company’s business. • Listen inside the company to those groups that are not happy and have been asking for change. • Maintain a very flat structure, avoiding a hierarchy that is too vertical. • Work with people you like and with whom you share common goals.